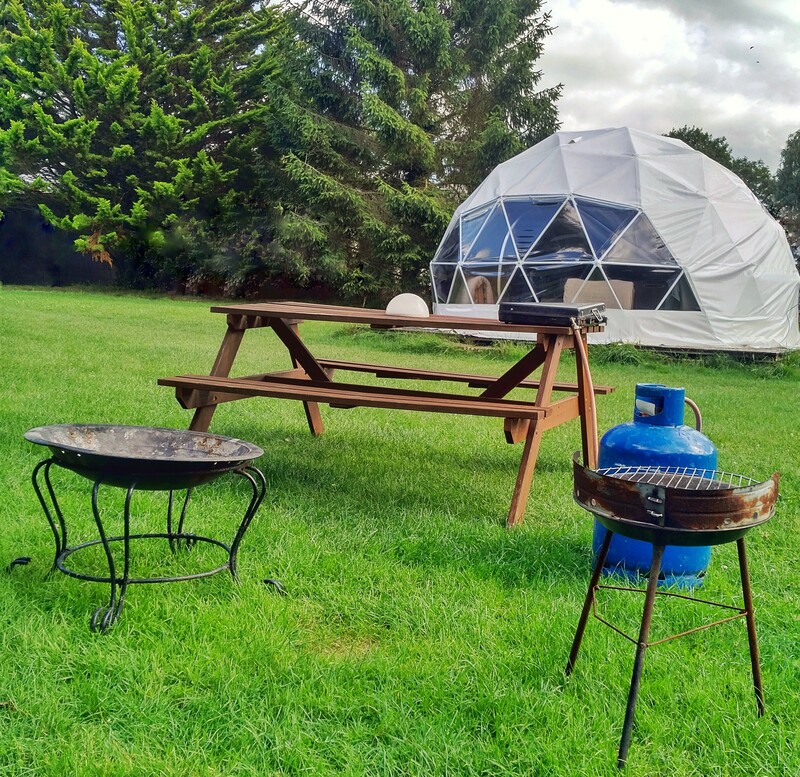 As the first glamping site in Dorset to provide Dome glamping, we thought they would make a perfect addition to our range of glamping accommodation. The glamping Dome is an insulated unit with double bed, two single futon sofa beds, chandelier light, electric stove heater, TV/DVD and Nespresso machine. 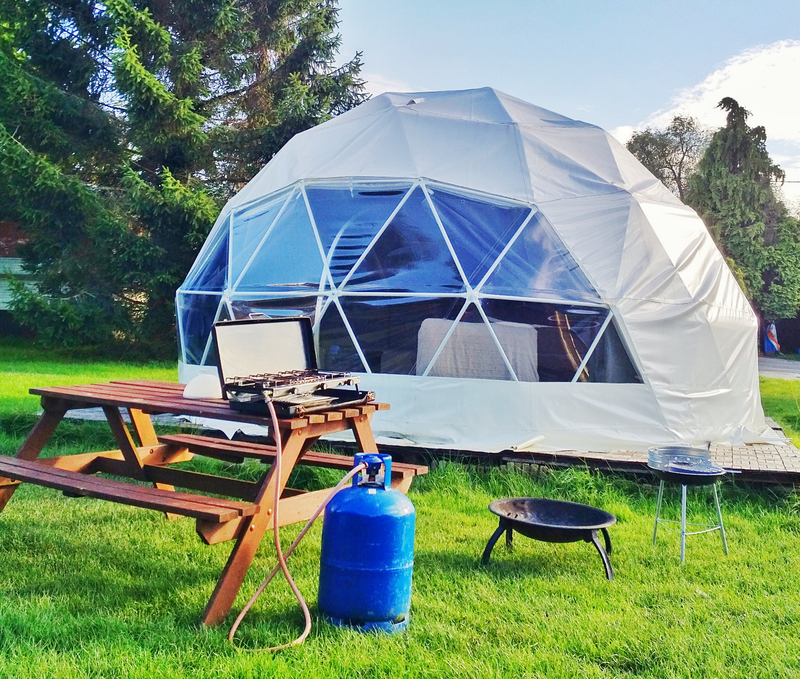 The Geo in GeoDome is short for Geodesic, Dome glamping is a fantastic, rare experience. The glamping Dome has a large window and is airy, bright and spacious inside. With modern interior design including a clever curtain to cover the feature window and an electric "stove" heater for cosy nights all year round. The modern interior of our glamping Dome has been specially designed to make this accommodation as spacious as can be. Like all of our glamping accommodation the glamping Dome has sockets, an electric coolbox and a hamper with cutlery, crockery, essential cooking items, whistle kettle and washing up items. Outside you have a gas stove, a fire pit and a barbecue. Inside you have a double bed and two single futon sofa beds, 'chandelier' electric light plus TV/DVD, electric faux-stove heater and even a Nespresso coffee machine with pods on arrival. In 2018 all our glamping accommodation booked directly with us includes a cereal basket and bottled water on arrival. One of the first glamping domes in the UK, our Dome is perfect for a birthday glamping celebration, let us know if you are booking for a special occasion! *Based on four people staying two nights or more during midweek dates in the low season. ^Pods on arrival for direct bookings.